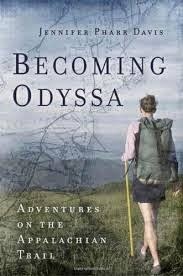 Meet the author, Jennifer Pharr Davis, for a discussion of her Appalachian Trail memoir: Becoming Odyssa. Bridgewater’s One Book One Community partnership will host Jennifer at the Horace Mann Auditorium, Bridgewater State University, on Thursday, May 22nd at 7:00 p.m. Many books have been written by thru-hikers, but none measure up to Jennifer’s epic. The Appalachian Trail speed record holder describes her journey from college graduate to a student of the trail. Her tales from the trail are full of adventure and inspiration. She offers concrete, trail-tested advice for aspiring hikers and she candidly shares her failures and frustrations along with her successes. Jennifer has hiked over 12,000 miles on six different continents and holds the endurance record on the 2,181-mile Appalachian Trail. Some of her hiking highlights include Mount Kilimanjaro, the Inca Trail to Machu Picchu, and the 600-mile Bibbulmun track in Australia. Davis is the owner and founder of Blue Ridge Hiking Company. She was named 2012 National Geographic Adventurer of the Year, Blue Ridge Outdoors Person of the Year and her Appalachian Trail record was voted Ultrarunning Magazine’s Female performance of 2011. Davis grew up in the North Carolina mountains where she developed a love for hiking at a young age. For more information about Jennifer Pharr Davis and Becoming Odyssa visit: http://blueridgehikingco.com. This semester’s One Book One Community program, focusing on Becoming Odyssa and Bill Bryson’s A Walk in the Woods, is a partnership of Bridgewater State University, Bridgewater-Raynham Regional High School, Williams Intermediate School, Bridgewater Middle School, Mitchell Elementary School, Friends of the Bridgewater Public Library, Bridgewater Public Library, Bridgewater Senior Center, and the Nunckatessett Greenway. Jennifer’s presentation will be followed by a book signing and books will be available for purchase.